We’ve been talking a lot about Brené Brown the past few weeks in our office and how to better create strong vulnerable teams. Her latest book is out, and I’ve been following along with her book club as they’re reading it. If you’ve been part of our community for any amount of time, then you know that we are huge fans of her work. We’ve used Daring Greatly as our annual community text, and we reference her TED Talk “The Power of Vulnerability” on a regular basis. Why is her research so relevant to the work that we – and you – do, and why do we keep returning to her time and time again, to learn more? Well, as with many of your fellow family businesses, you may find your own business in the throes of transition. The only thing that stays the same is change, as the old adage goes, and that holds true for family businesses as well. Your team is expanding! You are training and learning! Your roles are changing! You may find you’re actually outgrowing the physical constraints of your offices – literally and figuratively – to serve your customers better! Those are all great things! But any combination of those things can leave your entire team feeling unsure and uncomfortable. Humans do not easily weather change, and the resulting discomfort that change brings, can impact performance and team cohesiveness. In addition, as we race to get things done, we lose the connected feeling we have as a team. Communication breaks down. Stress builds. People can disengage with what they’re doing, and the group effort becomes disjointed. Each team member likely handles this scenario differently, but most coping mechanisms are unhealthy…leading to an unhealthy team. As a leader of your family business, your focus is on making sure the big-picture things are on-target. Your focus usually is not on the smaller details. Your team, though, while weathering the changes around them, might be struggling to focus on anything except the small problems. The team likely has ideas on how to do business better. The team will have some ideas about how to fix the underlying problem, whatever it may be, and how to reconnect. Team members are likely uneasy broaching the topic when they don’t feel connected to you and to each other. Reestablishing a connection is key to moving forward. That being said, naming those feelings of vulnerability and trepidation is a sign of strength. Your team needs your leadership to weather the test. Embracing those feelings as a team and working through them is an act of power and a sign of a healthy organization. It demonstrates the fact that your team trusts itself, and each team member trusts the group. In fact, creating and fostering an environment that encourages open and honest discussions about feelings, embracing that vulnerability, can propel the team forward to greater successes. Where do we start though? How do we facilitate that kind of “naming reality” meeting as leaders? You will have a deeper understanding of how everyone else sees the same problem. The problem now has facets, dimension, and depth. Understanding how the rest of the team feels, reconnects members to each other, and it will influence team member actions, both conscious ones and subconscious ones. Disillusionment is a sure result if you drop the ball and don’t develop a plan of action to address the problem. Actions speak louder than words. You will overcome almost all challenges if you maintain a connection to each other. Be open and honest in your communications. 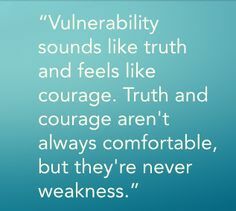 Embrace your vulnerability. It sounds like truth and it feels like courage. Want to talk more about how you can nurture your team’s strengths? I invite your comments.